The marker is a granite tablestone shaped like the tip of an arrowhead. 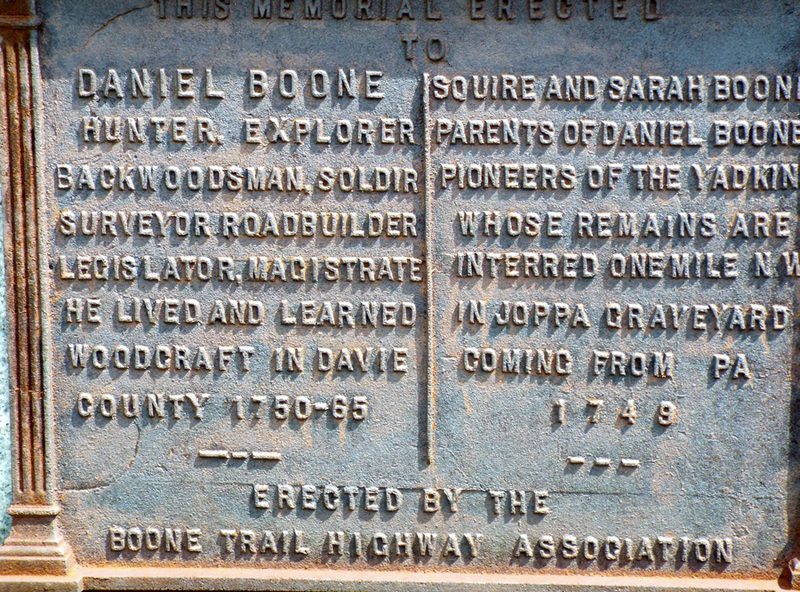 The marker’s front holds the primary tablet to the Squire Boone family. The Boone Trail Highway tablet has been attached to the narrow left edge when viewed from front. The front tablet is in the shape of a classical Greek building forming the frame. 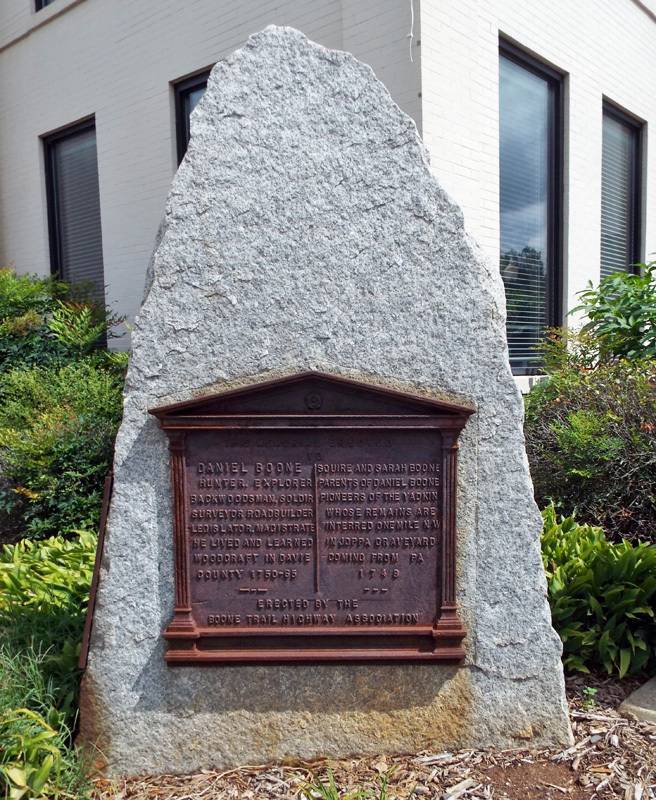 The Boone Highway tablet is a steel Style-2 seen as early as 1919, used through 1926 and distinguished by the BOONE TRAIL HIGHWAY caption being in block letters. 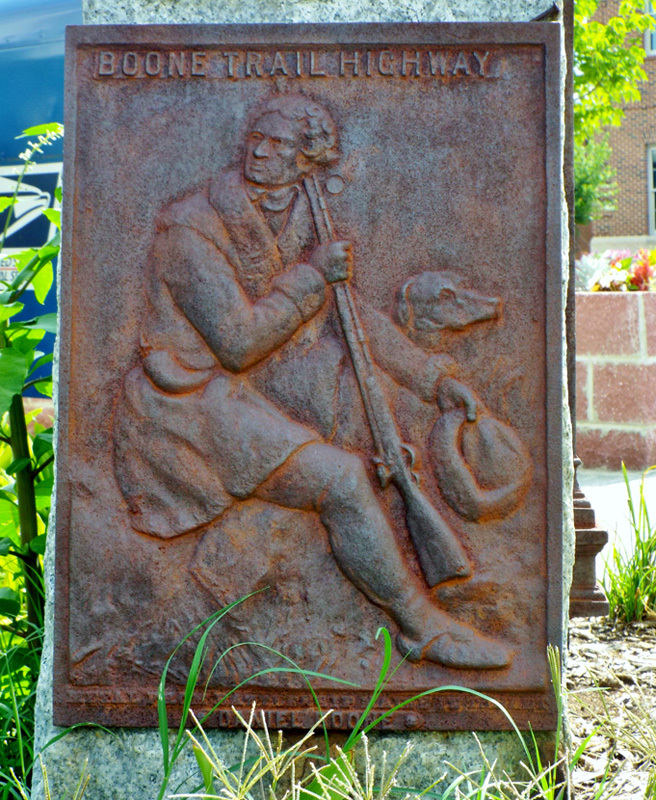 It holds an image in relief taken from Alonzo Chapel’s 1861 illustration of Daniel Boone and his hunting dog. A news article from 1918 states that a Boone Highway plaque was given to the school children of the county and a Boone Highway Association Chapter was being formed to also place a marker with other historical data. If this 1918 Boone tablet is the same as the one dedicated in 1925 it would be the earliest known example of a Style-2 tablet. This Boone Highway marker was numbered 15 by Everett G. Marshall. His interest and research of the markers led to the book, Rich Man: Daniel Boone. The numbering system was simply the order in which he found or became aware of a marker. The marker is located on the Courthouse Square, Main Street, in downtown Mocksville to the left of the courthouse entrance. 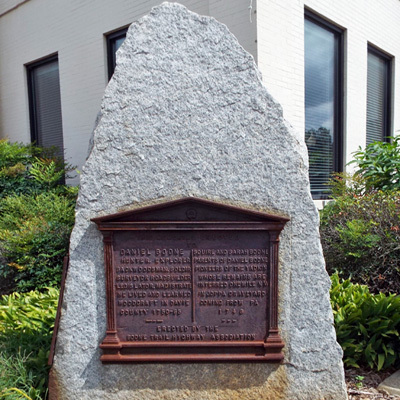 Across the street (US-158) in front at the right corner of the Davie County Register of Deeds is the Davie County War Memorial. Seasonal greenery and bushes are planted around the courthouse building.